All computers require some amount of memory or RAM (Random Access Memory). Many motherboards provide slots for as much as 16GB of RAM. Adding more memory can improve performance, allow more multi-tasking, and reduce the time required for intensive processes like video or audio editing. This guide will show you how to install memory in your motherboard. Note: Be sure to use proper precautions including an anti-static wristband or an anti-static mat to avoid hardware damage. Before beginning, make sure the memory is the correct type for your motherboard. Avoid touching the metal contacts or chips. Locate the memory slots on the motherboard as shown in the figure below. Note that your motherboard may have two or more slots, and the exact location may differ. Determine which slots you intend to install the memory into. 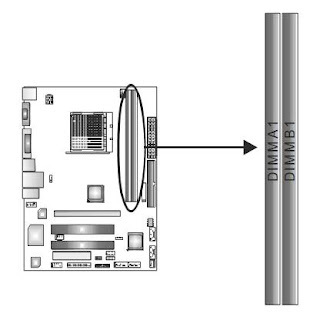 If you are installing one module, it will typically go in to DIMMA1 or a similarly named slot. For more modules, consult the motherboard manual for additional information. Push the retaining clips outward to allow installation of the memory module. 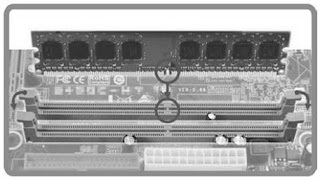 Align the memory module with the slot by using the off-center notch as shown in the figure below. Insert the memory module and vertically and firmly in to the slot until the retaining clips snap on to the memory module. That’s it! Your memory module is now installed. Repeat for additional memory modules if necessary.